Did you hear about the guy who ordered Charles Hodge's 3 volume set of Systematic Theology from CBD? He made the mistake of ordering Lewis Sperry Chafer's 4 volume set of Systematic Theology at the same time. When they arrived all seven volumes were in tatters from the theological battles they had en route. 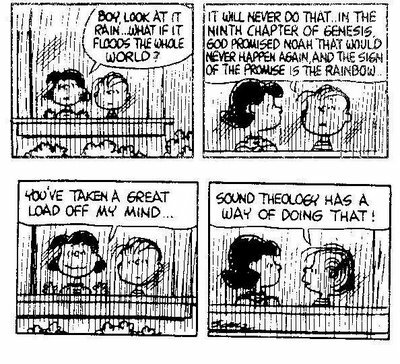 Sound theology? Which is the "right" theology? Perhaps Linus can give some insight! I'm reminded of A. W. Tozer's classis quote: "What comes into our minds when we think about God is the most important thing about us." I trust that those thoughts come from a sound theological understanding. Have a great weekend...in Christ! David...it's been a while since I've been visiting my blogger friend's sites. Entirely too busy or tired. But oh my...I'm richly rewarded when I visit your site. It's a place of comfort and fun...and challenging my faith.